For other uses, see Ballroom Blitz (disambiguation). 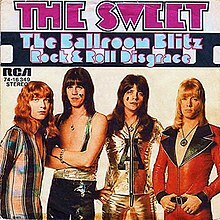 "The Ballroom Blitz" (often called "Ballroom Blitz") is a song by the British glam rock band the Sweet, written by Nicky Chinn and Mike Chapman. The song reached number one in Canada, number two in the UK Singles Chart and the Australian Chart, and number five on the US Billboard Hot 100. "The Ballroom Blitz" was inspired by an incident on 27 January 1973 when the band were performing at the Grand Hall in Kilmarnock, Scotland and were driven offstage by a barrage of bottles. The song was recorded at Audio International Studio, 18 Rodmarton Street, London. The song appeared on the US and Canadian versions of Desolation Boulevard but never appeared on a Sweet album in the UK, other than hits compilations. The initial guitar and drum riff of the song has similarity to a 1963 song by Bobby Comstock called "Let's Stomp". The first known cover of "The Ballroom Blitz" was by the Les Humphries Singers in 1975, which was the first German single to reach #1 in New Zealand. In 1979, the song was covered by the Damned, which featured Lemmy from Motörhead on bass guitar. It was released as a B-side to "I Just Can't Be Happy Today" and featured as a bonus track on their CD reissue of Machine Gun Etiquette. Other covers include renditions by Krokus in 1984, the 1988 Surf Punks album "Oh no! Not them again." (in the lyrics jacket, instead of the lyrics, it says "you should know the words by now"), Japanese glam rock band Scanch on their 1991 album "Ultra Romantic Bombers for Unlimited Lovers" under the title of "R&R Dynamite Kyoujidai", Christian rock band Calibretto 13 on their album Enter the Danger Brigade in 2000, Tia Carrere on the soundtrack to Wayne's World in 1992, and thrash metal band Nuclear Assault on their 1991 album Out of Order. In 2016, the Struts recorded a cover of the song for the soundtrack of The Edge of Seventeen. In 2017, the Featherz covered the song on their debut album Five Year Itch. This was originally intended for the CD edition of their 2016 single Forget All You Know. The song has appeared in many movies, including Wayne's World, Bordello of Blood, Romanzo Criminale, Daddy Day Care and The Sandlot: Heading Home. The song was featured in the BBC television series Life on Mars. The line "she thinks she's the passionate one" from the song are dubbed into the Beastie Boys song "Hey Ladies". The song was featured in a 2004 commercial for the Mitsubishi Galant. It was in the official soundtrack of the Ubisoft game "Shaun White Snowboarding". Since June 2016, the song has been used in public information films on the subject of smart meters surrounding gas and electricity use. The song is used in an episode of the cartoon Regular Show (season 4, episode 10) entitled "T.G.I. Tuesday" first airing on January 7, 2013. A cover version by the Struts is featured on the soundtrack of the 2016 film The Edge of Seventeen. ^ Savage, Jon (1 February 2013). "The 20 best glam-rock songs of all time". The Guardian. Retrieved 16 February 2019. ^ Harris, Keith; Gehr, Richard (29 August 2016). "20 Songs That Defined the Early Seventies". Rolling Stone. Retrieved 16 February 2019. ^ Wroe, Nicholas (12 September 2014). "That's neat: Chinnichap's blitz of 70s hits become a musical". The Guardian. ISSN 0261-3077. Retrieved 16 February 2019. ^ Dimery, Robert (5 December 2011). 1001 Songs: You Must Hear Before You Die. Octopus. p. 886. ISBN 978-1-84403-717-9. Retrieved 13 October 2015. ^ Beat Instrumental & Songwriting & Recording. Beat Publications. 1978. p. 88. Retrieved 14 October 2015. ^ Burns, Phil. "Recorded at Audio International". Philsbook.com. Retrieved 14 October 2015. ^ Popoff, Martin (15 August 2014). The Big Book of Hair Metal: The Illustrated Oral History of Heavy Metal's Debauched Decade. Voyageur Press. p. 20. ISBN 978-0-7603-4546-7. Retrieved 14 October 2015. ^ Swanson, Dave. "Top 10 Sweet Songs". Ultimateclassicrock.com. Diffuser Network. Retrieved 13 October 2015. ^ The Complete New Zealand Music Charts, 1966-2006: Singles, Albums, DVDs, Compilations. Maurienne House. 1 January 2007. p. 14. ISBN 978-1-877443-00-8. Retrieved 11 October 2015. ^ Steve Waksman (4 February 2009). This Ain't the Summer of Love: Conflict and Crossover in Heavy Metal and Punk. University of California Press. p. 327. ISBN 978-0-520-94388-9. Retrieved 10 October 2015. ^ Lemmy Kilmister (8 June 2012). White Line Fever: Lemmy: The Autobiography. Simon and Schuster. p. 120. ISBN 978-1-4711-1271-3. Retrieved 11 October 2015. ^ Mark Allan Powell (2002). Encyclopedia of Contemporary Christian Music. Hendrickson Publishers. p. 130. ISBN 978-1-56563-679-8. Retrieved 11 October 2015. ^ Martin Charles Strong; Brendon Griffin (2008). Lights, camera, sound tracks. Canongate. p. 396. ISBN 978-1-84767-003-8. Retrieved 11 October 2015. ^ "The Struts cover Sweet's "Ballroom Blitz" for The Edge of Seventeen soundtrack — listen". Consequenceofsound.net. 3 November 2016. Retrieved 27 November 2018. ^ "Romanzo Criminale- Soundtrack details - SoundtrackCollector.com". www.soundtrackcollector.com. Retrieved 20 April 2018. ^ "The Sweet - Ballroom Blitz Lyrics - MetroLyrics". www.metrolyrics.com. Retrieved 20 April 2018. ^ surge151 (16 January 2007). "Mitsubishi Galant - Accident Avoidance". YouTube. Retrieved 20 April 2018. ^ "Smart Energy GB Advert Song – Gaz & Leccy Out Of Control – Advert Music". tvadsongs.uk. Retrieved 20 April 2018. ^ a b Steffen Hung. "Forum - 1970 (ARIA Charts: Special Occasion Charts)". Australian-charts.com. Retrieved 2016-06-26. ^ "Austriancharts.at – The Sweet – The Ballroom Blitz" (in German). Ö3 Austria Top 40. Retrieved 10 October 2015. ^ "Ultratop.be – The Sweet – The Ballroom Blitz" (in Dutch). Ultratop 50. Retrieved 10 October 2015. ^ "Offiziellecharts.de – The Sweet – The Ballroom Blitz". GfK Entertainment Charts. Retrieved 10 October 2015. ^ "Dutchcharts.nl – The Sweet – The Ballroom Blitz" (in Dutch). Single Top 100. Retrieved 10 October 2015. ^ "Norwegiancharts.com – The Sweet – The Ballroom Blitz". VG-lista. Retrieved 10 October 2015. ^ Currin, Brian. "South African Rock Lists Website - SA Charts 1965 - 1989 Songs (A-B)". www.rock.co.za. Retrieved 20 April 2018. ^ "Swisscharts.com – The Sweet – The Ballroom Blitz". Swiss Singles Chart. Retrieved 10 October 2015. ^ "Official Singles Chart Top 100". Official Charts Company. Retrieved 10 October 2015. ^ "Sweet Ballroom Blitz Chart History". Billboard. Retrieved 11 February 2019. ^ "Top Selling Singles for 1973". Sounds. London, England: Spotlight Publications: 4. 5 January 1974. ^ "Top RPM Singles: Issue 3183". RPM. Library and Archives Canada. Retrieved 10 October 2015. ^ Top Records of 1975, Billboard, Section II, December 27, 1975. p. 38. Retrieved February 11, 2019. This page was last edited on 5 April 2019, at 00:19 (UTC).